My coming out process had been slow and incremental. I spent most of my teens wrestling with the idea, trying to convince myself that I wasn’t gay. For a long time I tried to be either bisexual or resign myself to a life a celibacy. I don’t want to get into the psycho-social reasons that some of us gay people cling to a bisexual identity for a while (and the disservice that does to actual bi people). Julie and I became active in a very out lesbian & gay chorus while we were still married to each other. By then a lot of people knew that I wasn’t heterosexual. But a lot of people didn’t. Most of my friends who knew seemed to be all right with it, but no one in my family knew. I had wanted to come out to the family (and some old friends who were still in the dark at the time) earlier, but had been talked out of it. After Julie and I legally separated and I was finally able to admit aloud that I was definitely not bi, I felt a need to make a definitive statement. A friend mentioned that there was going to be a National Coming Out Day March, starting at Westlake Center in Downtown, going up to Capitol Hill (Seattle’s gayborhood), and ending at Volunteer Park. It was starting not too late on the evening of October 11. My office was just a couple blocks from Westlake back then. It seemed like something I ought to do. Westlake Center is technically a park, but it’s a big concrete area surrounded by shops with a fountain and some sculptures. Lots of rallies and events happen there. Among all the usual after work downtown crowd was a group of people that were obviously “us.” There were rainbow- and pink-triangle- adorned signs and banners. I didn’t see my friend who had said she’d meet me there. I did see one guy I knew. He had been dating one of my classmates at the conservative methodist university I had been attending just a few years before. She had been a pretty traditional gal, and he had been very closeted. I had had no idea. I also couldn’t remember his name. He was holding a rainbow flag. 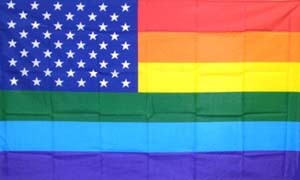 But not the usual gay pride rainbow flag. This one had a blue field with fifty white stars on it in the corner. It evoked the U.S. flag and the gay pride flag at the same time. When I saw and recognized him, he was involved in an argument with a pair of homeless guys who were very, very, very angry that faggots were desecrating the U.S. flag. The argument was getting spirited. A lot of us were kind of gathering around. I don’t know what any of us thought we would do, but it just seemed like we should gather close, just in case. Someone blew a whistle. Three or four people were standing on a nearby platform, one had a whistle, another had a megaphone. There was apparently going to be a speech. The two homeless guys (one had been angrily claiming to be a marine and a Vietnam veteran—I thought that latter was unlikely as he looked to be my age, so he would have been in junior high school when the U.S. evacuated all troops from South Vietnam) were startled by the sudden whistle and the person talking into a megaphone. They sort of looked around, as if just finally realizing they were completely surround by three dozen fags and dykes. They walked away. I don’t remember the speech. Somehow, even though at that time I knew several members of the Seattle branch of Queer Nation, I had not realized that it was Queer Nation that had organized the march. Queer Nation was controversial within the gay community at the time, as a lot of people objected to the name. Others objected to the very in-your-face radical politics. I had a lot of friends in both of those camps. I was… ambivalent. But I had made my decision that I was going to march in the Coming Out Day March, so I didn’t really care who had set it up. What was important was that we were doing it. It was a weeknight, there were, as I mentioned only about three dozen of us. About half of us didn’t have any sign or banner. We walked up the hill, a motorcycle cop following us slowly with his emergency lights flashing, since we were marching up the middle of the street. We chanted. We sang and danced the queer hokey-pokey (I kid you not). Which I think is a giant, steaming pile of meadow muffins. Even if it were true that simply publicly proclaiming that gay people exist in 1991 wasn’t a radical thing (certainly not as radical as it hand been twenty years earlier), saying we refuse to live in the closet, that we deserve the same rights and respect as everyone else, and that there is nothing shameful about being gay wasn’t mainstream by any means. And it still isn’t. Not really. 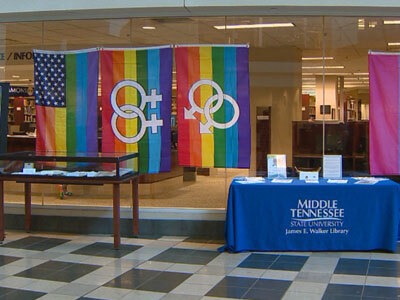 Middle Tennessee State University LGBT student group in controversy over these flags. Otherwise you wouldn’t have people so very, very angry about a gay, lesbian, bisexual, and transgender student group’s display that includes a rainbow flag just like the one we had in that march many years ago. Marching up that street more than 20 years ago, we didn’t change the world. But I, for one, wasn’t doing it to change the world, or even the city. I needed to make a declaration that I was no longer willing to be in the closet. And I needed a symbol, a ritual, something to mark for myself as much as anyone who saw me, that simple truth that I’m queer—specifically gay—and a part of this city, this culture, and this nation. And that’s what that flag means, too. I feel symbolically it was an important thing for you to do… for yourself, for those casual observers as well as for the other LGBT’s that were coming out on that day as well. Over time, I think events like this DO change things, if nothing else but to raise into consciousness the need for us to be more accepting and aware that different does not equal wrong. I thing the flag is a beautiful way to unite LGBT Americans who are faced with the need to fight for equal rights for marriage, employment, and anti-bigot protection under the law of the great country. Thank you for sharing!